(Seychelles News Agency) - The Seychelles’ protected atoll of Aldabra has reviewed its subsistence fishery activities in order to develop a new zoning plan for the protection of its rich waters from exploitation. According to the Seychelles Islands Foundation (SIF), which manages the unique raised coral atoll, a new automated on-board data collection app and database have been developed. 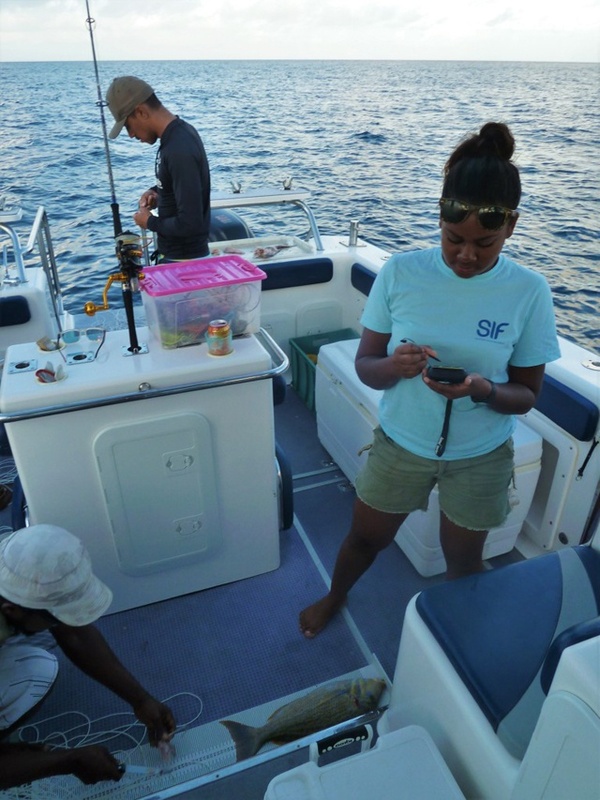 The aim is to facilitate the collection of data during fishing trips, which is expected to provide real-time analysis of any changes and trends in Aldabra’s subsistence fishery. SIF -- a public trust established in 1979 -- announced plans in August last year to extend the outer reef boundaries of the Aldabra atoll -- situated in the easternmost reaches of the 115-island archipelago of Seychelles -- to protect its marine wildlife. The purpose of the recent review was to ensure that the staff members and researchers stationed in this remote location - 1,100 kilometres from the main island of Mahe - have a well-balanced diet without putting any fish species at risk. Rosie Gordon, a volunteer from the UK working as part of the Aldabra research team, played a leading role in updating the way that Aldabra’s fishing activities are monitored. The new Aldabra management plan will see the introduction of a zoning scheme for the waters around Aldabra that restricts fishing to six Food Security Zones. Gordon told SNA in an email interview that a key part of this adaptive plan will be being able to respond quickly and effectively to the information that is collected through monitoring and then being able to take informed decisions as a result of having more up-to-date data. “Building on a trial set up in early 2015...the collection of fishing data via a handheld GPS device, instead of paper records, has been introduced and this uses a data collection software called CyberTracker,” Gordon told SNA. She explained that this allows the immediate capture of information, such as species, size and fishing method as the fish are caught - including valuable GPS location data. Even though fishing at Aldabra has to be kept to a minimum and is only carried out to ensure that the staff on the island are getting enough fresh protein in their diet, it can be a highly enjoyable pastime. Since fish biomass at Aldabra has been found to be over ten times higher than other areas in the inner granitic islands of the Seychelles, fishing at Aldabra can be comparatively quick and easy. SIF staff eat dinners together every week day, and the typical meal usually involves rice, fish or meat and a vegetable or salad side, and fish that feature regularly on the dinner table include various types of tuna and trevally. According to Gordon, a small, netted garden provides the team with vegetables and herbs throughout the south east monsoon season when no fresh food can be transported to the atoll. The raised coral atoll of Aldabra is comprised mainly of the larger islands of Ile Picard (West Island), Polymnie, Malabar Island (Middle Island) and Grand Terre (South Island), all surrounding the shallow lagoon. The area off the coast of the Ile Picard is historically the most fished as this is where the research station is located, and this will probably continue to be the case due to ease of access and the time constraints of fishing further afield. As members of both the logistics and the research teams participate in fishing trips, someone from the research team will be carrying out the role of data recorder responsible for the monitoring while everyone else is fishing. As for illegal fishing by outsiders, Gordon says this is an issue that may become increasingly problematic in the future. In November last year, five boats from the nearby Comoros were confiscated after they were found to be fishing in Aldabra’s protected waters.